In the past, I've met resistance to WebWork adoption because of its lack of books and documentation. "Struts has 50 books," they would say (ignoring the fact that you need a book to translate all the misnomers). No more! 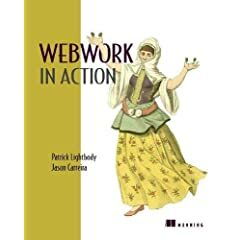 Pat Lightbody and Jason Carreira have released WebWork in Action. One great book about a great framework beats the crap out of 50 mediocre books about a crappy framework any day (nothing against the Struts book authors; Struts books are relegated to mediocrity purely by association *grin*). WebWork changed my development life! This book is where i started. A few years ago i was looking for a new framework to replace Struts which was just so frustrating and tiresome to use. I chose to use WebWork and havent looked back. Ive evaluated JSF, but cant see any real benefits im going to gain over WebWork. Somehow i feel Opensymphony have been cheated with Struts 2.0. Struts has the industry name behind it and Struts 2.0 is basically WebWork rebranded! I suppose its going to give WebWork more support - but i like the WebWork name. So yeah..... buy this. Even now, most of the book is applicable to Struts 2.0 (the concepts anyway) - maybe they should rebrand the book and resell it as Struts 2.0 in action - they might make a mint.